Original Content: I'm Baaaaack. With Food. And "Company's Coming." Today is Sunday, a day when I sometimes blog about food, and since I was saying when I left for what I'm calling family leave that this summer I was going to help give a baby shower, one with a children's book theme, I'm going to begin my return to blogging with that. Now, if you go to Pinterest, you'll find that children's book themed baby showers are a thing. You frequently see some of the same books mentioned over and over again, and the other hosts of our shower, who were more on top of things than I was, picked up four or five of them right away. This left me going, What shall I do? What shall I do? 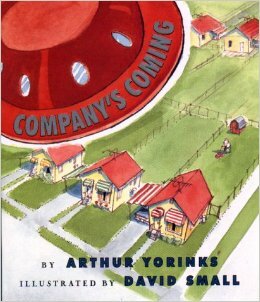 I have no recollection of how I came up with this idea, but to cut to the chase, I decided to cook something related to Company's Coming by Arthur Yorinks with illustrations by David Small. I don't think you're going to find this one on any of the Pinterest baby shower boards or in a board book edition for baby readers. But I love this book, it had a big impact on my life, and spaghetti and meat balls figure in its story. This almost alien invasion story most definitely deserves to be a baby shower staple. So we're talking spaghetti and meatballs at a shower that was not planned as a sit down affair with a plate on a table. Meaning a thoughtful host shouldn't be forcing a messy meal choice upon her guests. 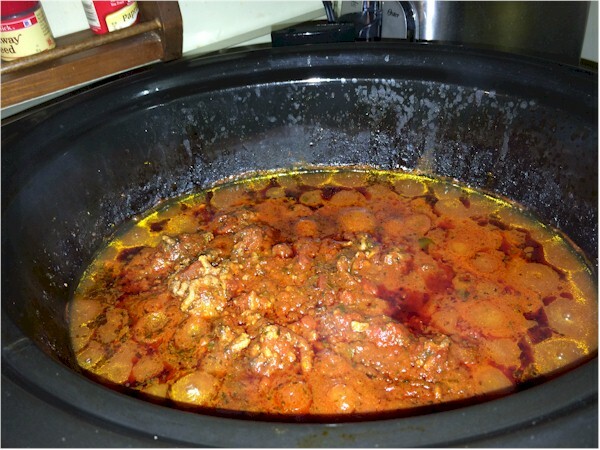 How could I make spaghetti and meatballs into finger food? You know, like a sandwich? Well, somehow I got from spaghetti sandwich to spaghetti sliders. My computer guy had some serious doubts about this project and suggested I check out its feasibility. So the first step was the feasibility sliders, which I think I took to someone's house for some event, though I can't remember those. It turned out, spaghetti sliders are, indeed, feasible. Spaghetti sauce, in case you can't tell. When shower time came around, I began the sliders by making sauce. Instead of meatballs, I used ground beef. Though Company's Coming describes meatballs, I didn't think they'd fit on a slider roll with spaghetti. I didn't use slider rolls, either. Even if I could have found them, I thought I'd go nuts filling mini rolls. 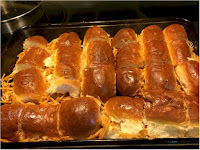 I used hot dog rolls instead and then cut them into sliders after they were filled. 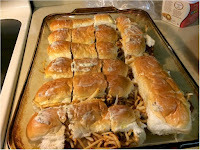 I broke the spaghetti up into small pieces before cooking it, because the feasibility batch of sliders taught me that I didn't want enormous strands of sauce covered spaghetti dangling out of little rolls. Then I mixed it with some sauce before making the sliders. Start big, then go small. I scooped some bread out of the rolls to make a hollow for the spaghetti. I also brushed the rolls with some margarine and Italian seasoning, though garlic butter would be an option, too. 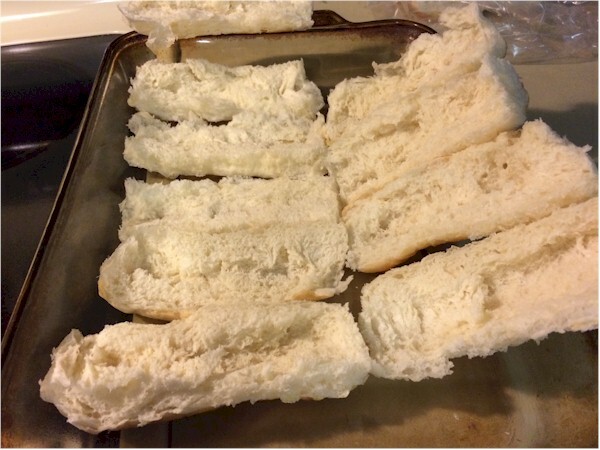 Then I filled the rolls, put them together, and cut them into thirds, so they looked slider-like. I buttered the tops with some more seasoned butter, covered the baking dish, and brought it to the shower site where I heated it just before serving. No, I don't know what I set the oven temp for or how long I kept the dish in the oven. But, come on, this isn't brain surgery. Heat the sliders at some temperature or another until they're hot enough to suit you. Next Sunday: All the children's book shower food. 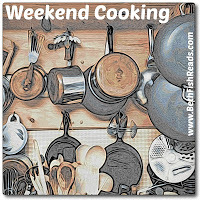 For the first time in nearly a year, I'm taking part in Beth Fish Read's Weekend Cooking meme. Great job in your modifications. I especially like the idea of using hot dog rolls and cutting them. What a time saver! Oh, a time saver. I could do this post in my Time Management Tuesday feature. 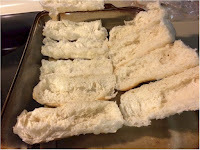 Though, really, I was more interested in keeping myself from going crazy stuffing little rolls than I was saving time. 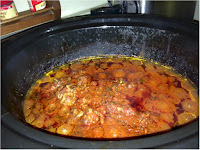 They were like Impressionist spaghetti and meatball sliders. If you stood well away from them, they LOOKED like spaghetti and meatball sliders. 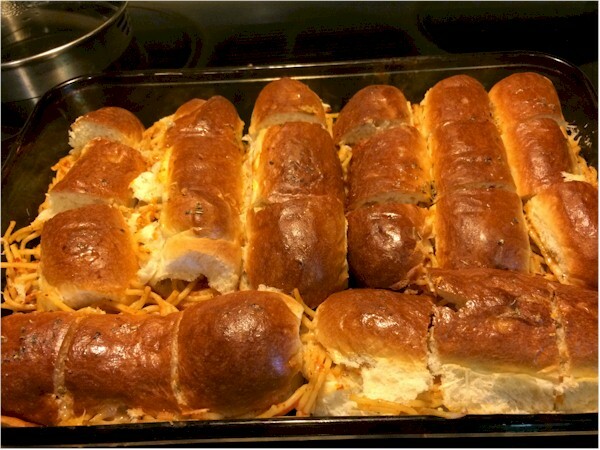 Yeah, I've gotten a lot of laughs from people over the whole idea of spaghetti sliders.